Location: 271 N 21st Street, but the main entrance is 20th and Parkway. Hours: 9:30 – 5:00 daily. Some exhibits may run longer. One of the most famous attractions in Philadelphia, the Franklin Institute is a science museum located across the street from Logan Square. It is a very popular destination for families, as it is one of the most kid-friendly attractions in the city. 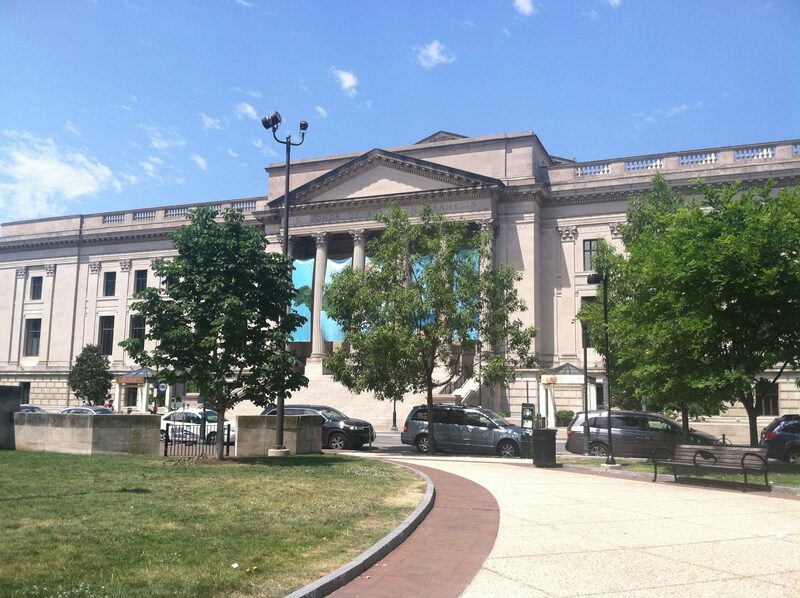 Named in honor of Benjamin Franklin, this museum was originally located in the current site of the Philadelphia History Museum at Atwater Kent, back when the Franklin Institute was more research-based than interactive. 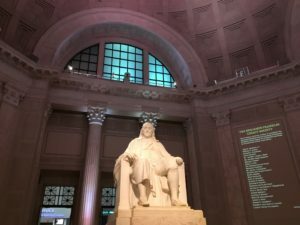 The Franklin Institute is also home to the Benjamin Franklin National Memorial, an enormous Neo-Classical rotunda modeled after the Roman Pantheon, where a massive statue of Franklin sits in the center on a throne based on that of the Lincoln Memorial. Visitors who enter the museum via the 20th Street entrance will enter through this room, making this the first impression. Quotes by Franklin are projected on the walls, as well as advertisements for the museum’s latest going-ons. Tickets for the museum can be bought in the atrium, a much more modern room with curving ramps, entrances to temporary exhibits and the IMAX theater, and snacks available. The atrium has a curving ramp leading to the second floor, where visitors can ride the SkyBike across. Don’t worry, there’s a net if you fall. The permanent interactive exhibits include the famous Giant Heart, which has been a staple ever since it was installed in 1954. The heart contains narrow passageways that visitors can walk through, and the functions of the heart are explained in detail. Bear in mind that the heart gets rather crowded and there may not be time to read these signs. Short films, several geared at children, also serve this purpose. This room also has models of the hearts of various animals, humans included. Other exhibits include the Train Factory, where a vintage locomotive can be explored with an exhibit on engineering. Adjacent to this is Electricity, which demonstrates the uses of one of Ben Franklin’s most famous discoveries through interactive and kid-friendly exhibits. Sir Isaac’s Loft, named after Isaac Newton, is an exhibit on the 3rd floor where machines can be manipulated by visitors. Several of them require a degree of teamwork, as it takes multiple people to operate. A Rube Goldberg machine can also be found here. These are visually appealing, as well as also very noisy. On a side note, the view from this room is spectacular. Nearby is the SportsZone, where visitors can test themselves in a variety of athletic feats. You can race against a track star, an Eagles player, or a Phanatic to test your speed. You can see how high you can jump, test your dominant hand, and see how fast you can pitch a baseball. Other exhibits highlight things such as the importance of helmets in football, or the efficiency of sports drinks as opposed to water. In the basement, the Train Factory has a Baldwin 60000 Locomotive, which shows how trains work using a real train, including the steam engines and machines that helped this train move before its arrival at the museum in 1933. Also in the basement, Space Command has a 50 million year old meteorite, which visitors are free to touch. There are also space suits worn by astronauts, and interactive exhibits highlighting the physics of space and space exploration. Nearby is KidScience, which teaches basic principles of science to children aged 5-8. The most recent addition to the museum, Your Brain gives the most viable explanation on how the brain works, which isn’t entirely known. The highlights here include a climb-through brain, a room of optical illusions and mind games, as well as a small station that simulates a firing neuron (which also tends to startle those who don’t know it’s coming…) This one is particularly interactive, in the sense that it is easy to participate in, considering that it shows rather than tells. The Franklin has three theaters. One of which is the IMAX theater, located behind the atrium. It is a dome, meaning the images are projected onto an overhead screen. The Franklin Theater, in the basement, shows 3D movies, in a typical movie-theater style arrangement. These two generally show documentaries or other educational films, which usually last 45 minutes. The Fels Planetarium is a classic, which shows space-related films. On the third floor, the Musser Demonstration Theater has live science tricks that may be too dangerous to do at home. The Franklin Institute is home to possibly the best special exhibits to come to town, which have included the Dead Sea Scrolls, things from Cleopatra, the Titanic, and the Vatican, to coincide with Pope Francis’ 2015 visit to Philadelphia. Recently, The Art of the Brick and The Science Behind Pixar were headlining attractions. Admission is $20 for adults, $15 for children. Admission to major exhibits is $30 for adults, and $25 for children. Admission to IMAX is $10 for adults, $5 for children. There are several places to get food here, including the Franklin Foodworks, where you can eat a full meal. Snacks can be bought in the atrium, right near the entrance to the IMAX theater. The atrium has the massive SciStore, which sells souvenirs, knick knacks, Philly-related memorabilia, and toys. Other gift shops are placed at the end of special exhibits.If you are travelling with a group, it may be wise to become members, so prices will be lowered.